Genuine, authentic, generous and supportive ... we would be very short of adjectives to define a man who has spent his entire life dedicated to music. A musical work always next to his humanitarian side, offering help to people and groups needy, denouncing discrimination situations, and always with a positive attitude for the construction of a better world where living together becomes a reality. His early entry into the world of music, has made these acknowledgments for his musical work and artruista life not have stopped produced over several decades. 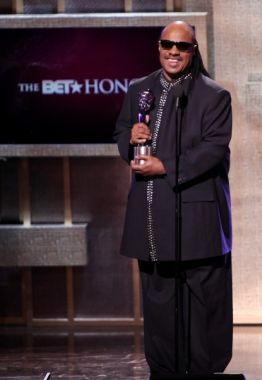 Messenger of Peace by the United Nations, Library of Congress Gershwin Prize, Kennedy Center Honor, NARM Presidential Award, Commandeur des Arts et des Lettres in France, Hall oF Fame, BET, Billboard Century Award ... Award honor list extensive due to the excellent and meritorious activity of Stevie Wonder. One of these awards was this 10 of February. A tribute to Stevie Wonder under the title "Stevie Wonder: Songs In The Key Of Life - An All-Star Grammy Salute", after completing the delivery for the Grammys 2015 at Los Angeles Nokia Theatre. Definitely pay tribute to the great musician par excellence and live legend of music with 25 Grammys, the universal Stevie Wonder. "Fingertips/Master Blaster/Higher Ground" Beyoncé, Ed Sheeran and Gary Clark Jr. Many prizes and awards will completing the curriculum of this great man, but the greatest of all them will be the residue of grateful hearts, more free and happy, thanks to his music and humanitarian contributions. The greatness of a man who seeks the universal state where love is the only thing that should prevail.